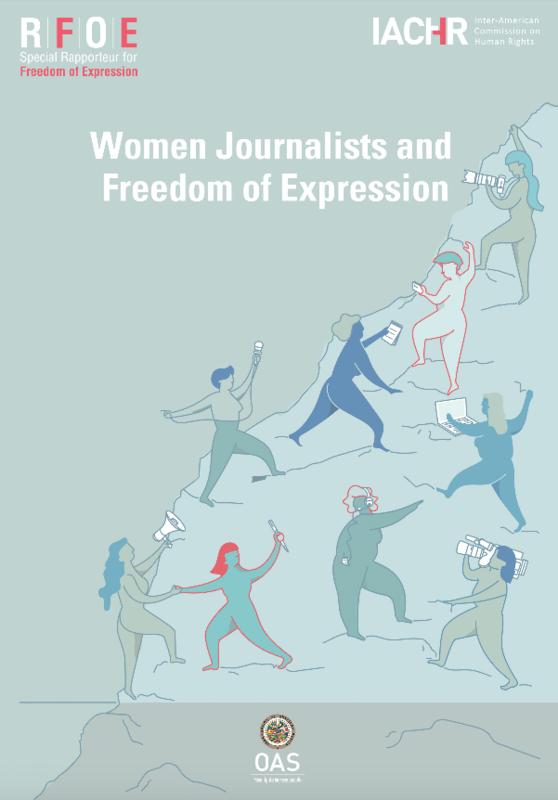 Women journalists are "twice as likely to be victims of violence" in the Americas for exercising their right to freedom of expression and for reasons of gender. This is according to the report "Women Journalists and Freedom of Expression,” published March 8 by Office of the Special Rapporteur for Freedom of Expression of the Inter-American Commission on Human Rights (IACHR). The report looks at physical violence against women, as well as harassment online and in the office place. Likewise, gender not only determines the different forms of violence, but these acts usually have an impact on their families. Women journalists report that attacks “designed to intimidate or silence them are perpetrated against their family environment, including their children,” the report stated. According to figures from UNESCO, taken for the Special Rapporteur’s report, in recent years there has been an increase in the murder of women journalists in the world. Between 2012 and 2016, UNESCO recorded 38 murders of women journalists, representing seven percent of the murders of journalists during that period. For its part, the Committee to Protect Journalists (CPJ) reported that eight women journalists were killed worldwide in 2017, which equates to 19 percent of all journalists killed that year, the report added. Between 2012 and 2018, the Office of the Special Rapporteur documented seven homicides in the Americas of women communicators and media workers for reasons that could be related to their work. The crimes took place in Colombia and Mexico. In Colombia, it recorded the cases of Flor Alba Núñez (2015) and the indigenous communicator Efigenia Vásquez Astudillo (2017). In Mexico, there were the murders of journalists Regina Martínez (2012) and Miroslava Breach (2017), as well as that of newspaper administrative worker Irasema Becerra (2012), of a Twitter user identified as María del Rosario Fuentes Rubio (2014) and of the blogger Leslie Ann Pamela Montenegro (2018). Sexual violence against women journalists is one of the topics that generates the greatest worry. In a global study conducted by the International Women's Media Foundation, mentioned by the Rapporteur’s report, of the 597 women surveyed, 63 percent said they had been threatened or harassed online, 58 percent threatened or harassed in person and 26 percent were victims of physical attacks. Although there are no general figures for the region, the report points out that in countries such as Colombia, Paraguay, Brazil and Mexico, women journalists have reported having been victims of violence and sexual harassment in the course of their work. In El Salvador, all women journalists who participated in a local study reported having experienced sexual harassment during their work in the field, and more than 96 percent said they experienced the same within the media outlets in which they worked. In Brazil, 75 percent of women journalists who answered an online survey for a local study said they received uncomfortable comments about their body, clothing or appearance in the exercise of their profession. One of the aspects that the Office of the Special Rapporteur highlights throughout its report is the increase in online violence of which women journalists are victims. It’s a fact also found by UNESCO in its report "World trends in freedom of expression and media development: regional overview of Latin America and the Caribbean 2017/2018.” These attacks are characterized by gender, which makes the comments "misogynistic and sexual," according to Special Rapporteur’s report. (paragraph 45). However, the dangers are not only in the street during coverage. The office is also a place where they are attacked, according to the report. There they receive unwanted comments about their way of dressing, they receive whistles, "jokes" with sexual content and unwanted physical contact. The situation is more complicated for indigenous or Afro-descendent women journalists, who are more likely to be stigmatized, the report stated. The Office of the Special Rapporteur notes with concern that the majority of reported cases remain unpunished. Although the organization recognizes that some States are trying to improve, it has “identified the absence of specific protection mechanisms and programs in some countries, as well as shortcomings associated with the design and effective implementation of existing mechanisms,” according to the report. For example, among the aspects mentioned in the report, there is a lack of public officials trained with a gender perspective to be able to receive and investigate complaints from women journalists. On many occasions, according to the report, women are revictimized. For this reason, the report culminates with a series of recommendations to the States regarding their three obligations to protect, prevent and seek justice in the crimes. Some recommendations have to do with the need to train their officials with a gender perspective, which will be put into practice when establishing measures and protection for women journalists. For example, that the journalist’s family also be taken into account. It also reminded the States that sexual crimes should be investigated with greater speed, and guaranteeing that people are not re-victimized. The Office of the Special Rapporteur also makes recommendations to media to work to improve the working environment by creating clear protocols to report harassment, as well as training in self-protection measures. The report was prepared in coordination with the IACHR Rapporteurship on the Rights of Women, and has contributions from the Inter-American Commission of Women, women journalists from the region, experts on the subject and civil society, the Rapporteurship said in a statement. See the complete report in English here and in Spanish here.